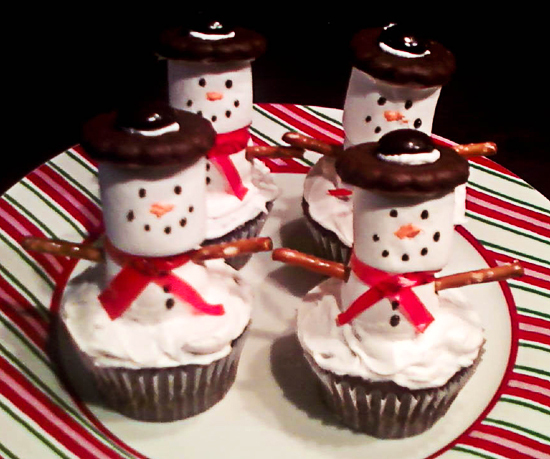 Snowman cupcakes - guest post by P'licious! I am so excited to share this post with you today! My friend Paula is not only a fun, kind and amazing individual who I love dearly, she is also a very creative and talented baker. I saw a photo of these cute snowmen that she shared on Facebook last week and asked her if she would like to share them on my blog, as well. I was beyond happy that she said yes! I was honestly like a giddy little schoolgirl about it. Maybe next I will ask her to share the OH-MY-GOODNESS-BEAUTIFUL cakes that she makes. They are unbelievable. These snowmen are adorable. Wouldn't they be a perfect treat to bring to a holiday party this week? Everyone, help me thank Paula for sharing her creativity and time with us!! Thank you, P'licious! 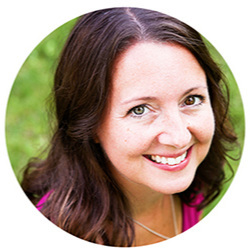 When Megan asked me to write a guest post for her food blog I was thrilled!! I have a passion for baking, but especially for making cakes and cupcakes. I had a dream of being one of those really cool cake decorators like you see on TV. I actually signed up for a cake decorating class once, but on the first day of class, the instructor didn’t show up and had apparently moved to Arizona. I took that as a hint and continued by just trying stuff on my own and have had a few things turn out really cute. These cupcakes were made for a work party and after working very hard on them decided they were way too cute and time consuming for co-workers. Don’t get me wrong, I like my co-workers, just not this much! They all loved them and appreciated how much time they took me to make, so I guess they redeemed themselves a little bit. Pick your favorite cake mix flavor, it doesn’t matter what you choose, it’s up to you. Bake the cupcakes according to the cake mix directions and cool. Just a little tip about box cake mixes; replace the oil in the recipe with an equal amount of softened butter. It makes a thicker batter and much easier to spoon into cupcake papers. 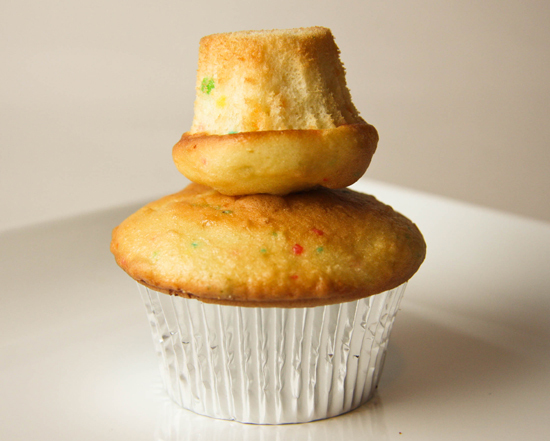 Frost your cupcakes with the white icing, make sure you leave some icing for putting your “top hat” together. 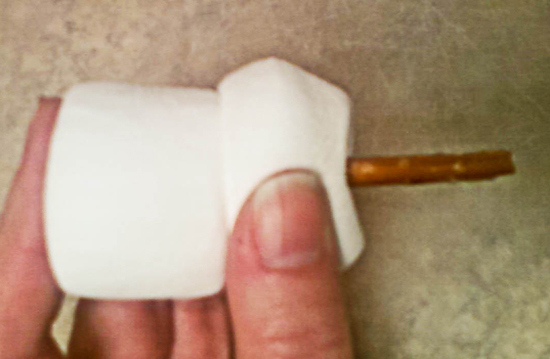 Take a marshmallow and flatten it with your palm on the waxed paper, then put another marshmallow on top and put a pretzel stick up through the flattened marshmallow. (Basically your flattened marshmallow will be the snowman’s tummy). Then stick it into the cupcake. Now using your decorator’s gel, add his eyes, mouth, buttons, and nose, obviously using the orange gel for his “carrot” nose. Next take a pretzel stick and snap it in half and then insert it in the body of the snowman for his arms. Now take your junior mint and put a bit of icing on it and add it to the cookie, then put some icing on the cookie and plop it on the snowman’s head. Last is the “scarf”. 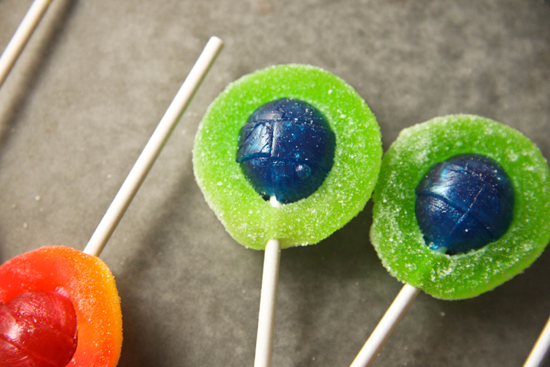 Unroll your fruit roll up and using a knife, slice off about a ¼ inch piece the long way. Wrap it around the snowman’s neck. I just overlapped it but if you had a long enough piece you could tie it. TA DA!!! Your family and friends will thing you’re a genius, but only you will know how easy they were, just a lot of time! If you’re anything like me, when you’re creating treats for family and friends, who cares how long it takes because you love them and want them to enjoy what you’ve made! One word of caution: I made these in the evening and then brought them to work the next day. The pretzel in the middle of the snowman absorbed a lot of moisture and started to bend, so, I hadsnowmen that looked like they had drank way too much eggnog!! Try not to decorate yours until an hour or so before you want to serve them or use a toothpick but PLEASE warn your guests about the toothpick!!! Cupcakes that taste as good as they look! Nutella is one of the foods I ate in plentiful quantities while I was pregnant with my second son. One morning, early on in my four months of bedrest, I laid on the couch on my left side to help calm my contractions as I watched Mystic Pizza and dipped my finger into a Nutella jar. Have you watched Mystic Pizza within the last ten years? There is something so awesomely terrible about watching 80's movies 25 years after they have been filmed. Regarding eating Nutella like an animal, there is nothing terrible about that. I found this most delicious recipe while searching for a yummy treat to make for our Bloggy Day last month. And yes, it tastes as good as it looks. Preheat your oven to 325 degrees F. Line 12 muffin tins with paper liners. With mixer on low-medium speed, add 3 eggs to the mixture, one at a time, until fully combined. The batter may not appear totally smooth at this point. Fill each muffin liner 3/4 full with batter. 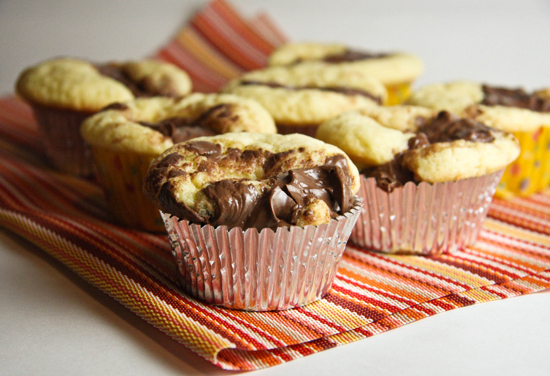 Top each with 1 1/2 teaspoons of Nutella. Swirl the Nutella with a toothpick or sharp knife and fold the batter over the Nutella. Bake in the preheated oven for 20 minutes. Allow to cool completely. Or not. I most certainly did not. Preheat oven to 325 degrees F. Line 12 muffin tins with paper liners. Cream together butter and sugar until light, 2 minutes. Add in eggs one at a time, until fully incorporated. The batter may not appear smooth. Add vanilla. Stir in flour, salt and baking powder until batter is uniform and no flour remains. Using an ice cream scoop for uniformity, fill each muffin liner ¾ full with the batter. Top each cake with 1 ½ teaspoons of Nutella. Swirl Nutella with a toothpick or sharp knife, making sure to fold a bit of the batter up over the Nutella. Bake in preheated oven for 20 minutes. Allow to cool completely. My 4-year-old has a very hard time being patient, as I'm sure most 4-year-olds do. We have learned not to tell him we are going to the park, to Grandma's house, to the zoo, to the mall (all places he loves), until two minutes before we are ready to leave. If we break this rule, the whining for "paa-aa-aaaaa-aaaaark" or "Gwaaa-aaaaa-maaaa's hooo-ooouse" gets ridiculous. I gambled big time by showing him my new cupcake cookbook (What's New, Cupcake?) and telling him to pick out which cupcakes he would like me to make for his birthday....TWO WEEKS in advance. "I want my moooo-oooo-ooooonster cuuu-uuuup-caaa-aaaa-aakes!" Ugh! So, by the time I finally got around to making these, I felt a little bit of tension between myself and these little colorful monsters. Once they were done, though, they were so stinkin' cute! I fell in love. And most importantly, my birthday boy adored them. First, bake 12 cupcakes, whatever flavor(s) you desire, according to package directions. Also, bake 12 mini cupcakes according to package directions. Since I was making these for a birthday party, I made three different flavors: yellow, chocolate and confetti. Kids like options. 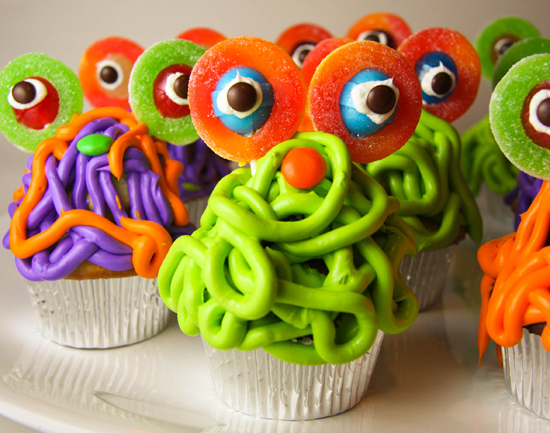 While the cupcakes are baking and cooling, prepare the monster eyes. 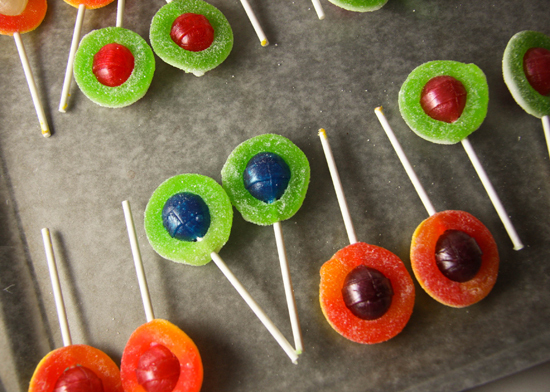 Push the stick of a dum-dum lollipop through an apple or peach ring and pull the ring around the lollipop. This is super slick. They wrap right around each other like they were meant to be together. Do this 24 times. It doesn't take long, I promise. I used canned vanilla frosting, but feel free to make your own. Place a few spoonfuls of vanilla frosting into a large Ziploc bag and cut a teeny hole in the corner. By "teeny," I mean around 1/8 of an inch. Squeeze the bag so frosting comes out of the tip. Dab a small circle of frosting in the center of each dum-dum. Before the frosting hardens, place a brown mini-M&M directly in the center. Allow the monster eyes to sit for a few minutes in order to fully harden. Prepare the frosting that you will be using to cover the cupcakes with. I used a total of 2 jars of store-bought vanilla frosting and divided it between three small bowls. Using neon food coloring, I made one of the bowls bright orange, one bright green and one bright purple. 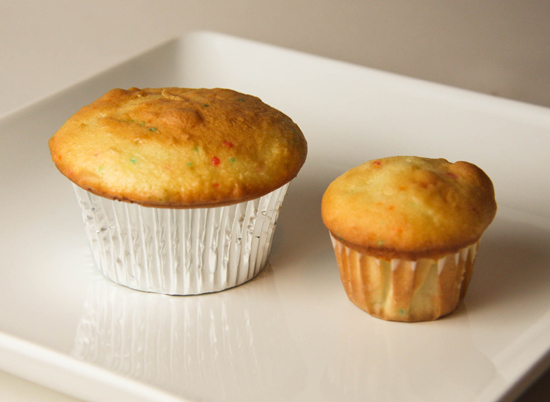 Grab a cupcake and a like-flavored mini cupcake. Remove the wrapper from the mini cupcake and turn it upside down. 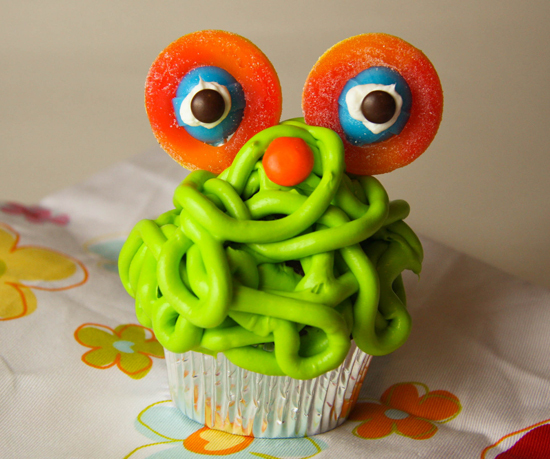 Place it on top of the regular-sized cupcake. If you'd like, squirt some frosting between the two to help keep them in place. Spoon the colored frostings into three separate large Ziploc bags and cut an 1/8 to 1/4 inch off the corners. 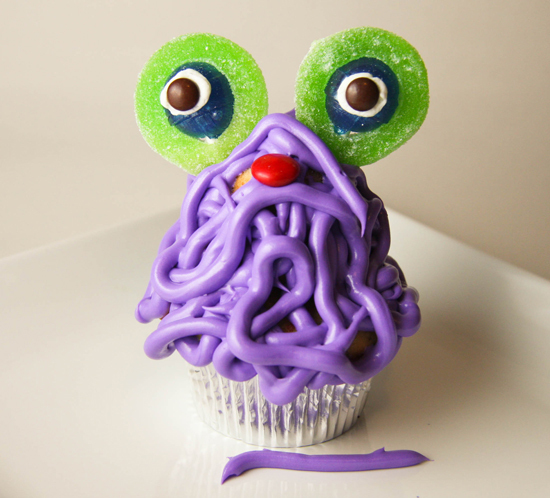 Squeeze the frosting over the surface of the cupcake, in "strings," completely covering it. This was my favorite part! Get crazy! 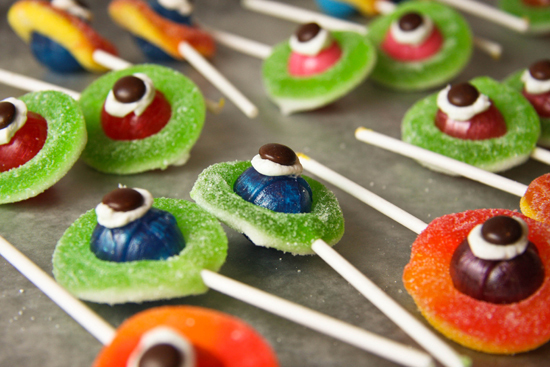 Push the sticks of the dum-dum eyes into the cupcakes. Give the monster a fun M&M nose, if you'd like. Aren't they adorable? They were an absolute hit for my boy and his cousins. I had leftover cupcakes, so I made a few different kinds of monsters. 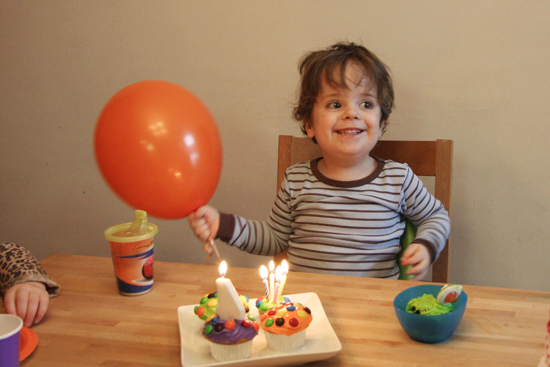 And I made a special plate for the birthday boy. Have you ever seen a happier face? I was tickled pink to find a recipe that involves caramel, apples and cupcakes! I think that in Heaven there will be one room in my home that will contain only caramel apple cupcakes. They will line the walls, floors and ceiling, they will make up an elaborate..